I've found myself leaning towards old postcards with recent Pic of the Week posts. Check out some of the previous postcard posts and let me know which is your favorite! Here's another for this week, sent in 1912. When he comes calling for the rent. It appears to be written from "Billie" of Chaffe, Missouri. On May 22, 1912 Billie wrote this postcard to Mr. Clyde George of Calumet in Houghton County, Michigan, a county in Michigan's Upper Peninsula. "Centennial Location" must refer to the area of Centennial in the heart of Calumet Township. Centennial was one of the dozens of copper mining towns in the area during this time. I am still in Chaffe, will see you this summer tho having a good time. Hope you excuse my long delay in writing. I know I am ?? for that. Mr. Clyde George appears to be the young man born in 1892 in Centennial, Michigan. The 1910 Federal Census indicates that he lived with parents, John and Mary George, his two brothers and one sister. Clyde was 17 and worked as an Engine Oiler in a copper mine. Clyde died of pneumonia five years after receiving this postcard. He was only 24.
Who was Billie and what was his relationship with Clyde? 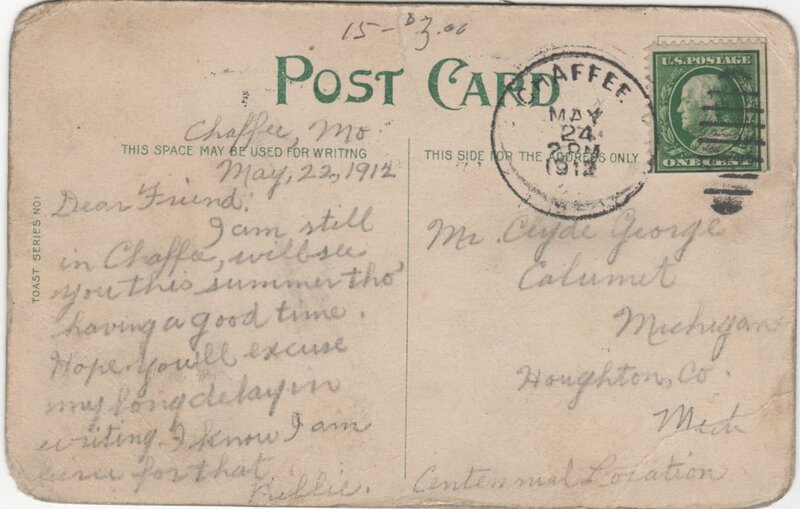 Are there any surviving descendants or relatives of Clyde's who might like this postcard as a genealogical keepsake? If so, can you help me find them? 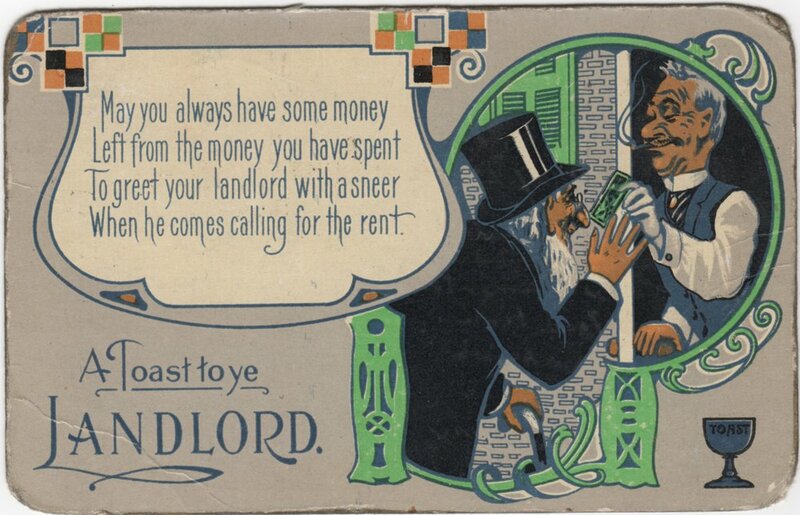 Why would you want to greet your landlord with a sneer? I have ancestors in and near Houghton, MI during this same time. Did any of them known Clyde or the other Georges? What was Clyde's life like? Did marry? How long was he sick? Did Billie attend his funeral? What do you think, feel, and wonder about as you learn these tidbits of this stranger's life? As always, happy searching and have fun!